Given my frequent attention to the Islamist menace, I’ll bet lots of you good readers assumed this would be a focus on some imam or ustad, maybe in the London Borough of Tower Hamletstan! Wrong. I’m no racist – any terrorist, brown, black or white, is fair game, and I’d have them all put up against a wall and shot. And as for ‘Men of God’ who give aid and comfort to such swine, I despise and loathe them all, regardless of race, creed or colour. And so to Ulster, whence my ancestors sailed in the 1830s, but which will always be dear to my heart. One has to allow a certain latitude to parsons and priests, because they are meant to set examples of loving one’s enemy, which I have to say is something I tend to be not very good at. Read it all and vomit! This dog-collared cur would be tarred and feathered in the good old days, but at the very least today he should be ‘unfrocked’ or whatever his denomination do to acolytes of evil. And I think a look back at that poor old buffer Captain Boycott, who was ostracised by all, is not such a bad idea. Shop-keepers should refuse to serve Latimer, dentists and doctors decline to treat him, bin-men neglect to collect his rubbish. The Works! I’m sure readers can add other ideas. See RRA 18th and 28th September, and 29th October, to remind yourselves of why this tihng McGuinness should be regarded as a foul leper. As McGuinness campaigned in the Irish midlands town of Athlone on Monday, he found his way blocked by David Kelly, who held a framed portrait of his father Patrick.The IRA killed Patrick Kelly, a 35-year-old private in the Irish Army, as well as a policeman in December 1983 as Irish security forces tried to arrest an IRA gang. “I believe that you know the names of the killers of my father. And I want you to tell me who they are,” Kelly told McGuinness. When McGuinness denied knowing the IRA members involved in the 1983 shootout, Kelly said he must know since he was a senior IRA figure. “That’s not true,” said McGuinness, who during the campaign has insisted he quit the IRA in 1974, the year of his last prison conviction for IRA membership. Several authoritative histories of the IRA, Irish police and the Irish government all say McGuinness remained an IRA commander until the outlawed group renounced violence and disarmed in 2005. Kelly said his father “was loyal to this Irish Republic, I’m loyal to him as a son, and I’m going to get justice for him”. 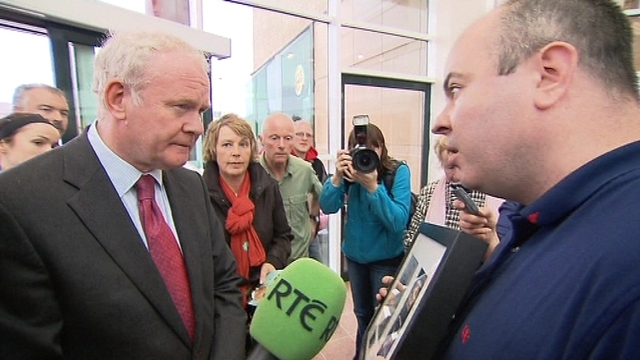 McGuinness said he understood Kelly’s pain and sympathised with him. Who will free us of this turbulent priest…? What a stupid man. ← Sharia for Canada? Round ‘Em Up, Kick ‘Em OUT!